It is also possible that the service member is entitled to BAH if living apart from their dependents - such as during unaccompanied overseas tours – in which case the BAH would be based on the dependent’s residence ZIP Code. In general, the OHA program is designed to help offset housing expenses for a member and/or dependent at the assigned overseas location. The reported housing must be the actual residence that the member occupies and from which the member commutes to and from work on a daily basis. OHA is intended to assist in paying for private sector leased/owned housing for a member and/or a member’s dependent. Every member that is authorized to live in private sector leased/owned housing is authorized OHA, provided an Individual Overseas Housing Allowance (OHA) Report (DD Form 2367) is completed by the member and approved by the senior officer of the Uniformed Services in the country concerned (or the individuals or offices designated for that purpose by the senior officer). The FSH allowance is payable to a member with dependents for added housing expenses resulting from separation from the dependents when a member is assigned to a Permanent Duty Station (PDS) outside the contiguous United States (OCONUS) or incident to an assignment in the contiguous United States (CONUS) when dependent travel is delayed or restricted. FSH has two types – BAH Based Location (FSB-B) and OHA Based Location (FSH-O). BAH-Partial is authorized to those service members without dependents who is assigned to single type quarters or is on field or sea duty and is not otherwise authorized to receive a BAH or OHA, under various conditions. 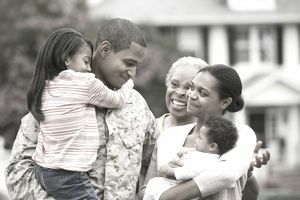 BAH-DIFF is the housing allowance for service members assigned to single-type Government Quarters (or a single type housing facility under a Uniformed Service’s jurisdiction) who are authorized for BAH solely by reason that the service member pays child support. BAH-DIFF is the difference between the with- and without-dependents BAQ rates (originally established as of 31 December 1997 increased by the average pay raise percentage each year) and is published annually. However, if a member is not assigned to Government Quarters, but is authorized BAH or OHA on behalf of a dependent solely on the basis of child support payment, that individual is authorized a “with dependent” housing allowance (either BAH or OHA). Two exceptions to eligibility: If the member’s child(ren) is (are) in the custody of another active duty member (including a former spouse) who is either assigned to Government-owned / leased family type Quarters (not including privatized housing) or is in receipt of a “with dependent” housing allowance or on behalf of the child / children, that regardless that the member is paying child support, there is no eligibility for BAH-DIFF. If the member’s child support amount is less than the BAH-DIFF rate, then there is no eligibility for BAH-DIFF. The BAH-Transit allowance rate is a temporary housing allowance paid while a member is in a travel or leave status between Permanent Duty Stations, provided the member is not assigned Government Quarters. The Transit rate continues during proceeding time and authorized delays en route, including TDY en route. BAH-RC is the housing allowance authorized for a Reserve Component (RC) member called or ordered to active duty for 30 days or less - except for an RC member called to active duty for a contingency. An RC member called to active duty for a contingency is authorized the BAH/OHA rate even for tours of 30 or fewer days. The BAH-RC rates are established by the Secretary of Defense (SECDEF) and are determined and set forth in the JTFR.